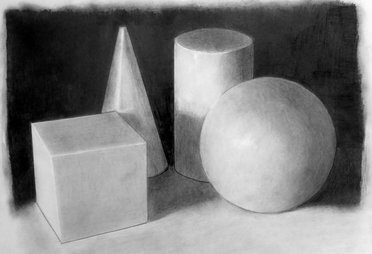 You will be completing 2 projects that will help you improve your shading skills. 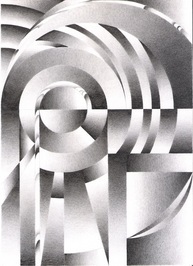 The focus for this project is two-fold - drawing basic shapes and using a single light source. There are two geometric shape still lifes set up in the room. Choose the one that you can see the best from your seat. You may use a drawing board at your table or in your lap so that you can draw parallel to the surface of the board. Decide on paper direction (vertical or horizontal). Be neat. Put scrap paper under your hand to avoid smearing the graphite. Clean up smears and fingerprints. The focus of this project is to learn how to use graduated shading and create an awareness of how values effect each other when placed side by side. Before beginning this project, practice directional shading. Below is a chart that you need to replicate in your sketchbook. There are 11 boxes with a written description for each listed at the bottom of the image. You must do all 11 boxes. Each box should be approximately 1' x 1". Shading should be smooth and done without smudging. Try to get smooth transitions from one tone to the other. Be neat and stay inside of your box edges. Send a photo of your directional shading chart into Schoology. 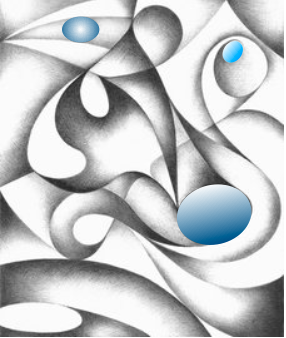 For this project your will create an abstract design and use graduated shading to add emphasis to the shapes. There are examples below to help you get started. Please don't copy any of the examples. The easiest way to create this design is by using a grid. You are not required to use a grid but it is helpful if you are struggling for an idea. Below are a few examples of grid designs. The 4 square is the most basic. Your design is created in one square then flipped and copied into the other 3. The second grid has 16 squares. In this case, the squares help divide the space for a more complex design. A random design is placed no top to create interest.. Designs should be of a medium complexity. Once you have drawn out your design, you may begin to add your shading. This will take some planning. First, choose 3 small areas that will be painted with one color later. DON"T SHADE IN YOUR SHAPES. These will be painted in later. Each section should have at least a light value so that no section is totally left unshaded. Values beside each section should vary so that each section stand out from the other.